I mainly play the saxophone, outside of printmaking, so I wanted to make a print that would reveal itself much like music may. At first glance these embossed prints may look blank, but to the keen and steady eye much more is revealed. 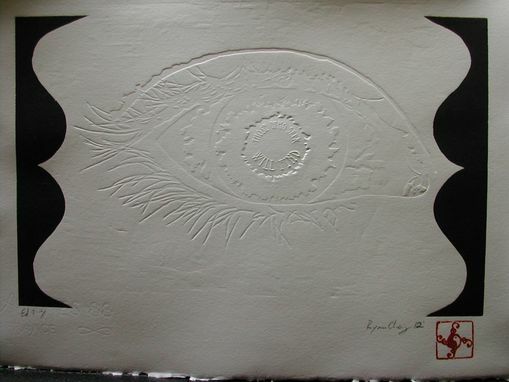 Production of an embossed print is as follows: I hand-carve a prepared plank of wood, either Shina or Cherry ply-wood, with a reverse of the intended image; the image flips when the paper is revealed from the printing . 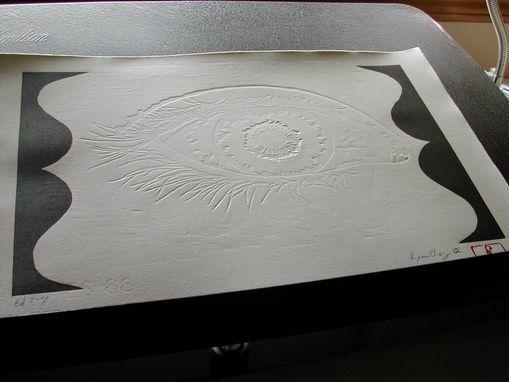 Using moderately wet paper, in this case Arches 88, I hand-print the image with a "Baren" or textured disk. The baren in intended to imprint the paper as well as pull ink "up" from the block. There is not ink used in this process, which leaves a sharp impression of the wood. To include a border or color, another block must be carved and printed with ink. Although the addition of more blocks adds to supply cost the carving is usually much faster, due to less detail. Size can be as small as 4 by 4 inches or as large as your imagination. However, if exceeding 2 by 2 feet, extra time will be spent finding an appropriate piece of wood.